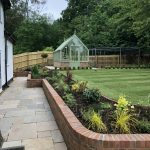 This was a large garden project we undertook in two halves starting with the back garden. The existing garden was just a large lawn area with a small paved area in front of the patio doors on a couple of split levels. We started by stripping all the old lawn off and disposing of allowing us to dig out for a new larger terrace area. Extending out from the patio doors and also widening the paths around the house, building a low brick retaining walls leading up to the lawn level. We also sloped the flower beds slightly to help give the feel of depth as you sit inside looking out. 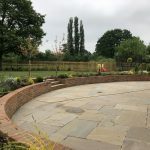 The patio area was paved using Raj Indian sand Stone laid using the four various sizes and being a natural stone, which complimented the style of garden and house. 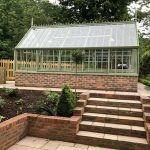 Our clients were keen gardeners and wanted to include a large greenhouse and vegetable garden with raised beds and cage to grow their own produce. With compost bins and a shed, they had everything catered for. 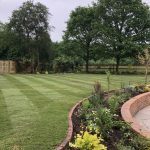 All the garden borders and edges were edged with a brick on edge to create a definitive line against the grass. Also, we installed new fencing around the garden not just to keep the children in but also the Monk Jack dear from coming in to eat the new planting. 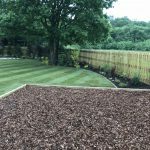 We landscaped the lawn area and raked level bringing in new topsoil to top dress and turfed. 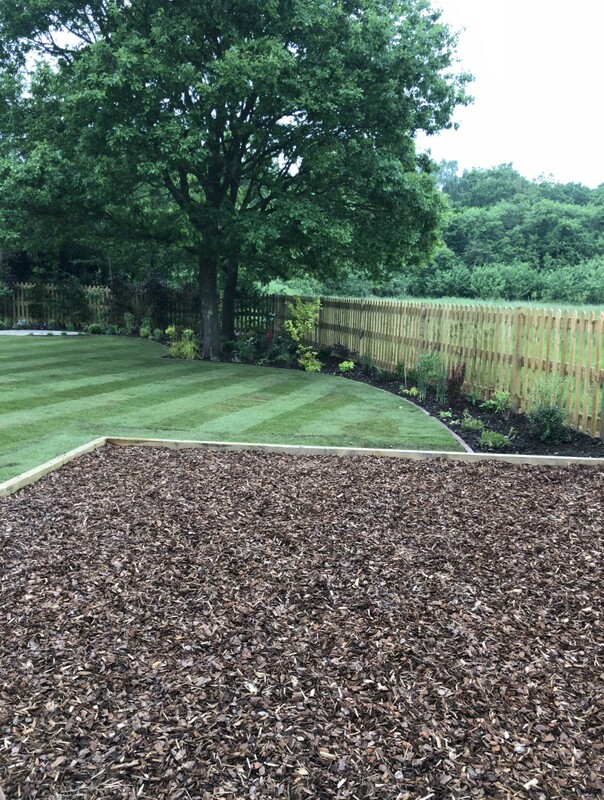 Having young children, they wanted to create a safe play area which we lowered into the ground and edged with sleepers to retain and filled with play bark to create a safe shock absorbent surface to safely play. Under the shade of a large tree, we created a small circle seating is where mum and dad could sit and enjoy whilst keeping one eye on the children playing in the barked area or the large lawn area. We also created a hard-standing area for a hot tub which all the family enjoy. The second phase was the front garden. Taking down an old garage which made room to create a large circular drive edged using Granite Sets and finished using a grid system filled with shingle. With fully automated gates at either end and hedging planted and fenced created a safe secure front garden without the hassle of getting out of your car to open and close the gates. We continued with the Raj Indian paving with a brick edge for the main entrance to the house which continued around bordering between the house and new Rother Panel fence. 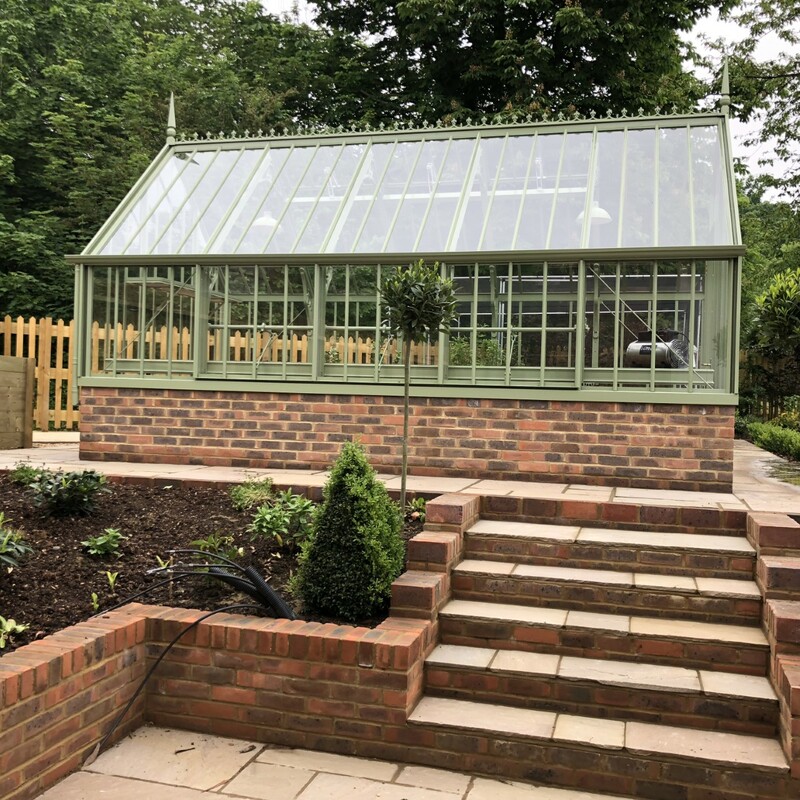 The front and back gardens both had lighting schemes installed as well as mains power and lighting for the shed, greenhouse, hot tub and gates. Contact us today for a friendly chat about your vision.